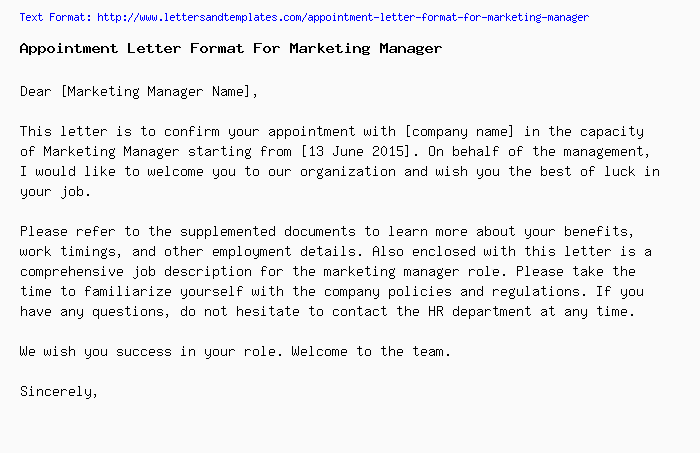 This letter is to confirm your appointment with [company name] in the capacity of Marketing Manager starting from [13 June 2015]. On behalf of the management, I would like to welcome you to our organization and wish you the best of luck in your job. Please refer to the supplemented documents to learn more about your benefits, work timings, and other employment details. Also enclosed with this letter is a comprehensive job description for the marketing manager role. Please take the time to familiarize yourself with the company policies and regulations. If you have any questions, do not hesitate to contact the HR department at any time. We wish you success in your role. Welcome to the team.